CULVER CITY, Calif. - Dec. 9, 2016 - PRLog -- After 4 spectacular years, noted actor and late night hopeful Motown Maurice is ending the Quarterly Wrap Festival (QWF) that he created. It's been a successful journey and all are invited to celebrate on Saturday, December 10th at the Mayme A. Clayton Library & Museum in Culver City, California. "I created The Quarterly Wrap Festival only two and a half years after I arrived in LA. Four years later it's coming to an end and I couldn't be prouder. QWF began as a free festival to all and it has maintained the same integrity in the finale. It provided opportunities for a myriad of filmmakers and actors throughout it's course. Most importantly it allowed me to do what I do best, which is bringing people together. Next stop late night television," declared Motown. The Quarterly Wrap Festival (QWF) was founded in Los Angeles in March 2013 by Motown. 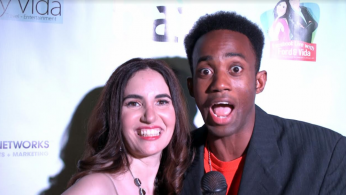 Four times a year, at the end of each quarter (March, June, September & December), QWF tailored a unique showcase targeting a wide range of actors, filmmakers and industry professionals in the Los Angeles area. During its first two years, this festival maintained a focus on film screenings. In 2015, the festival evolved into a series of monologue slams competitions. In 2016, QWF transformed into a Variety Talent Showcase welcoming a range of singers, dancers, poets, stand-up comedians and more. Finalists for the grand finale are Maggi Mayfield, J. Lacoon, Deborah Ishida, Glasme, Lorinda Hawkins Smith, Wanda Ray Willis-Raynor & Whenda Woolley. Judges for this esteemed event are talented actors Jeff Meacham and Eric Paul Erickson as well as noted writer-director Jonathan Cocco. For four years the festival maintained its goals and objectives by creating a collaborative atmosphere aimed towards bringing exposure to independent up-and-coming artists. Serving as a conduit, the Quarterly Wrap Festival provided unique experiences designed to showcase, network and celebrate each other's accomplishments while providing an avenue of discovery for emerging creators. In just four years,The Quarterly Wrap Festival executed 8 film screenings, 8 talent showcases, multiple networking mixers and one agent management seminar. Award-winning actress and blogger Vida Ghaffari (The Mindy Project, Jimmy Kimmel Live) will be hosting the last event. "I am truly honored that I was handpicked by Motown to host this wonderful event. Motown is such a great talent and so selfless to create such a grand event that truly benefits our artistic community-at-large," said Vida. Don't miss out. Admission is free for everyone. Your vote counts. Be apart of the voting audience.